The reason a lot of smokers find it difficult to become non-smokers is that they frame their intention in the negative - speaking about 'giving up' and focusing on lack. 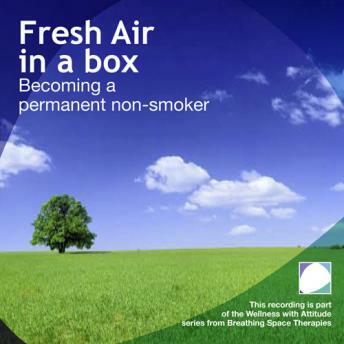 Fresh air in a box will help you take control of your smoking situation enabling you the deep inner strength to take each day at a time in order to give up forever. Note the use of positive language in this title. The reason a lot of smokers find it difficult to become non-smokers is that they frame their intention in the negative - speaking about 'giving up' and focusing on lack. Focusing the brain on the benefits of becoming a non-smoker gives the intention much more power and gives you a more positive incentive. Self-hypnosis allows us to by-pass the critical sensor of the conscious mind and to access and change some of the subconscious negative belief patterns into more positive and helpful thoughts. Daily practice with this recording helps you become a permanent and lasting non-smoker, whilst maintaining a healthy weight.